Hello! It is week 5 of the One Room Challenge and I have some good updates and tips for you! Here are the past weeks to see what I have been up to. Wallpaper was installed by Katie and it was looking amazing! This is the first time I have had wallpaper in my house! As she was installing it, the sconces arrived via mail and the paper shades looked really dark compared to the white I was expecting. I actually thought they sent me the wrong shades. I was thinking I would have to either paint the shades or find new ones. Wonderful. My husband came home that night and started installing the beadboard, it was looking great and I was feeling good again. I had picked out Chantilly Lace (Benjamin Moore). My husband starts painting the ceiling and I quickly realize the white is way too stark for the room. I have to go to the paint store to find a new white and I decide on White Dove (Benjamin Moore). I come home and I’m good again until I start painting the beadboard with primer and realized the beadboard can’t be white. The room needs a darker colour to anchor all of those cranes! I really didn’t anticipate that white wouldn’t work! So I’m trying to figure this all out on Wednesday night with my two kids running around, I have a sinus infection and a tight timeline for the week because we are having a Halloween party in a few days. We decide that we need to choose a different colour and it will have to be painted Thursday night to get the bathroom back together in time for our party. The next day during my lunch break I searched for blues/greens that I liked. I ended up going with Green Smoke by Farrow & Ball. 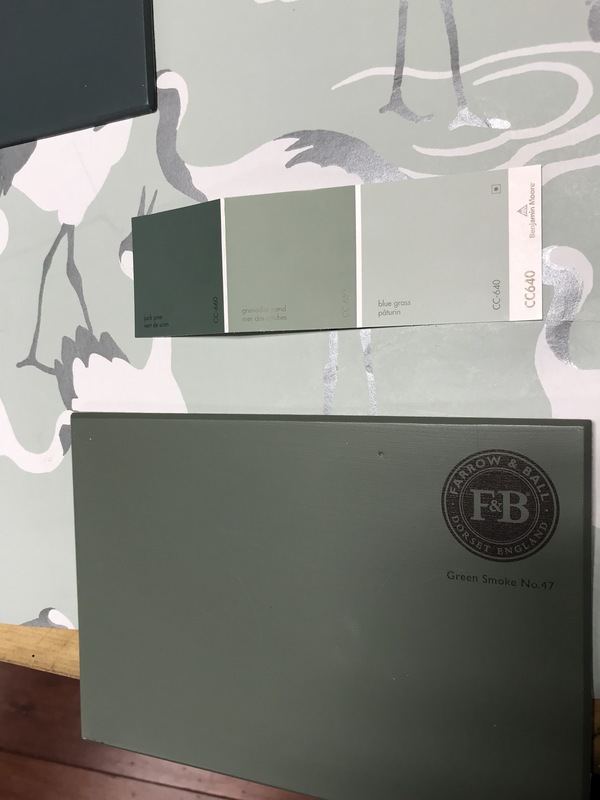 Apparently Farrow & Ball describes this colour as “an uncertain green/blue/grey colour popular in the second half of the 19th century. The sounds like the perfect description for the colour I chose in the situation I was in! It’s now painted and I love it!!! 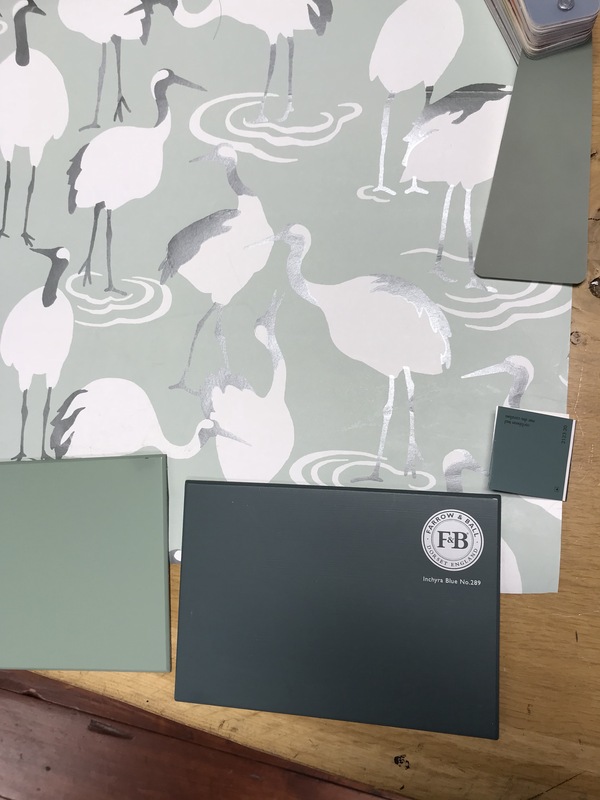 I am still so surprised how wrong my colour choice was for that room with the crane wallpaper. About the lights… they worked after all. I called the store and apparently they lighten once you use them. Sure enough they did. Plus once the beadboard was painted, the mirror was added and all the trim work was added, the shades worked well with everything. I love them! Here is Katie with some tips for choosing wallpaper! What type of wallpaper to choose? Regarding types of wallpaper, I recommend “Non-Woven” (sometimes marketed as “Paste The Wall”). Non-Woven wallpapers are a new technology wallpaper, which are breathable, and install virtually seamless. 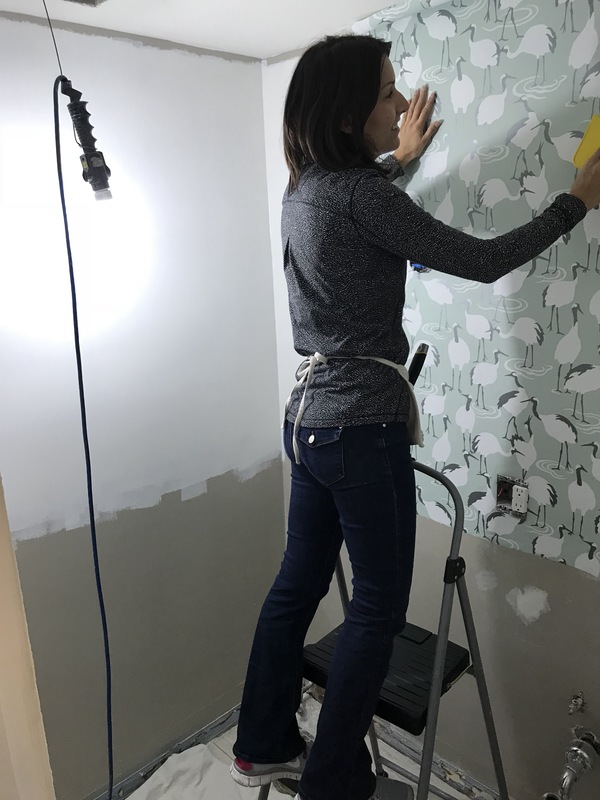 When selecting wallpaper, it’s always a good idea to order samples or bring home the wallpaper books, to see how the wallpaper looks in the space with your lighting. I also recommend looking at wallpapers available in store and online in “big box stores”, as they carry a nice selection of wallpapers, which are priced well, and are refundable. 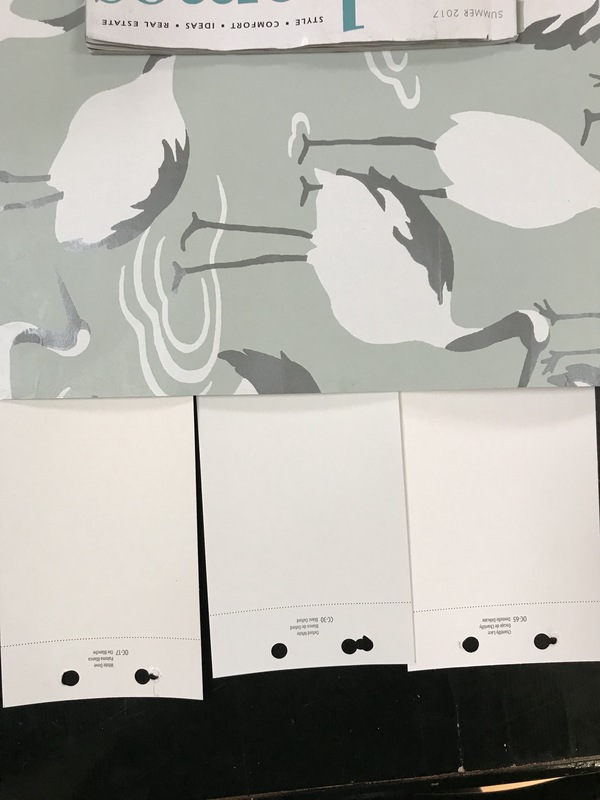 When purchasing wallpaper which is in stock, it is always important to ensure the Lot/Batch number match for all the rolls, which is listed on the label. This ensures both the colours and patterns match when the wallpaper is installed. Thanks, Katie! Check out her website www.katieswallpaper.ca for more tips and pictures of rooms she has done. 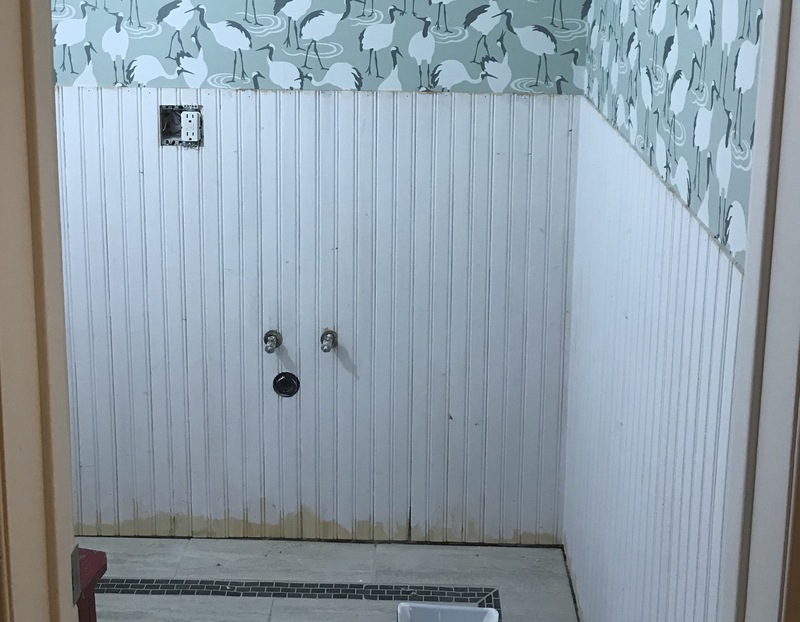 Communicate with your partner… apparently my husband didn’t know I started this challenge until days before the wallpaper was installed (oops). Moving into the 6th week, well.. I haven’t done much. Next on the list is figuring out art for the bathroom. I’m so tired from last week that I’ve only started to think about the bathroom again! Check out other guest participants here and the featured designers here for their week 5 update! Love the paint color with the wallpaper! Hang in there and I hope you are feeling better.